Among all of the debated topics when it comes to natural hair, good edge control appears to stir up the most controversy. Edges refer to the small strands of hair that are around the “edges” of your hairline. Some people choose to lay their edges flat, whereas others simply let them fly about without much care. The term “my edges were snatched” has been used to describe everything from shocking moments to cute hairstyles. “You have no edges” or “your mom has no edges” could be used as insults! Regardless of your opinion on the subject, however, there’s no denying that finding good edge control for natural hair can be difficult. If you decide to try smoothing your edges, your hairstyle will have a sleek and sophisticated appearance that will definitely turn heads. It works especially well for the likes of frohawks, twas, bantu knots, and protective styles (ex. buns, updos, etc.). To really pull off the appropriate look, you need to find a good edge control product for your hair. Luckily, we’ve done the hard work for you, and created a comprehensive list of the best edge control products for natural hair. According to anecdotal evidence, many of the edge control products on the market just don’t seem work very well. To help you avoid making the wrong choice, we’ve created a list of the best edge control products for natural hair. Eco Styling Gel with olive oil is a multipurpose hair gel that will give you great hold. Based on anecdotal evidence, this styling gel doesn’t usually cause flakes. Plus, it’s an alcohol-free product. STYLING VERSATILITY WITH LONG LASTING HOLD- Gentle formula is safe for relaxed and natural hair textures, yet strong enough to provide a long-lasting firm hold. Apply to the hairline for a polished finish and restyle without the need to wash out until wash-day. A little bit goes a long way! ENRICHED WITH HONEY & SHEA BUTTER- Formulated with Honey for added nourishment and a luminous, natural sheen while Shea Butter provides moisture and restores hair health from the inside out. Alcohol-Free, Sulfate-Free and contains NO PARABENS, NO PARAFFIN, NO MINERAL OIL. This product is fantastic for anyone with tightly curled hair or an overall coiled hair type. According to Design Essentials, this product works best for those with 3A-4C hair textures. The product formula includes avocado and almond oil. It offers plenty of shine, reliable hold, and all of your flyaways will be a thing of the past. The argan oil edging product from Creme of Nature, Perfect Edges from Morocco, provides long-lasting edge control. We’ve seen this product work for ladies with both natural hair and relaxed hair. This is a very light pomade styling gel, that will work on multiple hair types. It’s made with amla oil from the Indian gooseberry. Many women also use amla oil for hair growth, to prevent hair loss and mitigate rapidly graying hair. 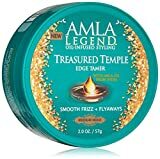 If your edges are frail or thinning, the Treasured Temple Amla Legend might be a good option. This lightweight product is able to provide a firm hold that still remains manageable enough for styling. The formula’s blend of shea butter and coconut oil allows it to work without leading to dry or frizzy hair. This is another great option that offers shine and a frizz-free experience. There are a few different variations available, including blueberry and passion fruit. Both options have the added bonus of smelling wonderful! The water-based organic product formulation doesn’t contain sulfates, silicons, or parabens. This edge tamer is completely colorless, and there’s no worry of flaking or greasiness. The hold will stand up throughout the course of the day without fail. 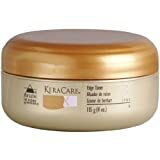 The Keracare Edge Tamer was formulated to work on natural and relaxed hair. This product, which is infused with wheat protein and jojoba oil, is a strong edge control edge. According to Dr. Miracle, it works well on natural, relaxed, and braided hair. They also recommend it for ladies with hair extensions or crochet braids. In this video, Carmen from My Natural Sistas provides a tutorial on styling your edges and sideburns. Carmen uses a toothbrush and IC Fantasia edge control gel. The IC Fantasia styling gel is a very effective, high potency edge tamer for ladies with natural hair. With that, you should have a better understanding of which edge control products are actually worth your while. You might be surprised to find that there are so many good edge tamers on the market, but you have to remember that there are a lot of different types of hair out there! Nothing is for everyone, but there’s likely at least one or two among the list above that should work well for your needs. Thanks so much for this list. After doing the work of s/c and styling my clients hair I felt frustrated because I just couldn’t get those edges to smooth out to give my clients that just left the salon look, that polished look with my name on it. Your list was very comprehensive and I will keep trying to achieve slaying those edges for those clients who want it. You’re welcome, Mary. Hopefully, the list is helpful for you as you work with your clients. 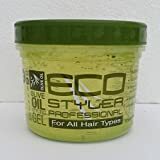 I have the eco styling hair gel but in the organ oil version. Is that still ok? Sorry, I meant argan oil obviously, autocorrect will not let me live. Hi Monica- not a problem at all. Yes, Eco Gel works great. Have you tried it? Did your hair respond the way you wanted? The eco gel with coconut oil has a light texture can it still hold my edges and my hair entirely? Eco Gel with Coconut Oil can work, but it greatly depends on the type of hold you are looking for. It is light and gives a good hold that is not hard to the touch and the hair doesn’t look hard. You can help by tying a scarf around your edges. If you want a tackier (sticky) gel, have you tried Gorilla Snot?